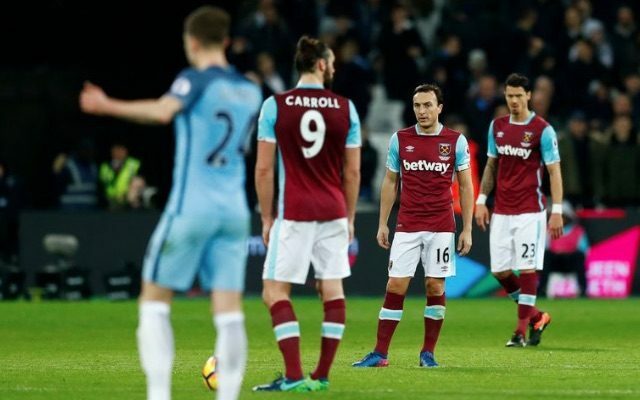 Unhappy Hammer Darren Chapman rates and slates West Ham players following Wednesday’s 4-0 loss to Manchester City. Pep Guardiola’s Man City arrived at the London Stadium full of confidence after a 5-0 FA Cup victory there earlier in the month. With West Ham’s Dimitri Payet saga over and with two wins on the bounce I thought it was going to be a different game. How wrong I was. Man City made West Ham look like the under-19s. Following goals before half time from Kevin De Bruyne, David Silva and MOTM Gabriel Jesus, the stadium was all but empty. A Yaya Toure pen wrapped things up in the second half. No chance with goals, Sunday league defending in front of him. After two impressive games, I thought the right-back spot was sorted, but Byram was nutmegged by Sane for one of the goals and was basically a ghost out on the pitch. One of the very few players who seems bothered for the Hammers so far this season. Not his best night, though, as he couldn’t handle the pace of the City attackers. Thrown in by Slaven Bilic for a tough debut against very good opponents. Looked slow and clumsy, giving away a silly foul for Toure pen. Looks a shadow of the flying wing-back from last season. Terrible again. Positioning was awful. Needs to be dropped. Tried hard like he always does, with lots of running, but against the City midfield he was chasing shadows all night long. Early booking didn’t help. A massive crowd favourite, Mr West Ham looks like he’s had his day. Plays like a crab – side to side, with slow sloppy passing. Another who must be dropped, surely. Hardly noticed him on the pitch, ran around like a headless chicken and barely crossed the half way line. A lot of pressure on this young man now Payet has left. He made a few neat touches, but gave the ball away far to often. Not his best game. Booked. Seemed the only player who was going to do anything for the Hammers. One run from inside his own half at the City defence was the highlight, but it came to nothing. Alone up top on his own. Looked frustrated and when West Ham did try the long ball he couldn’t seem to win a header. Booked. Showed energy when he entered the field, but was mainly a spectator watching Man City’s showboating performance. Hard debut for him. Coming on 3-0 down against Man City is not ideal. Shows promise though and will improve this team. Lovely through-ball for Antonio but goal ruled out for offside. The young man came on for the final 10 mins and hardly touched the ball, but in fairness to him the game was already over.